A new decade of Rocky Patel Vintage cigars. Rocky Patel's Vintage Series is his bread and butter. They're the cigars that put him on the map years ago. And even today, they continue to wow c​ustomers - new and old alike. There's a reason why these heralded handmades have scored so highly, on so many occasions - with ratings reaching as high as 93-points. Because, well, the cigars are simply exceptional. And now, the Rocky Patel Vintage cigar saga continues. This round features a dark and oily 8-year-aged Cameroon wrapper overtop a robust blend of Nicaraguan and Dominican long-fillers that are equally well-aged. Flawlessly constructed, this medium to full-bodied handmade delivers a serious array of flavor including notes of cedar, black pepper, coffee, and a caramel-like sweetness on the finish. It's got some oomph, it definitely has plenty of flavor, and it's smooth and well-balanced too. Yet another feather in RP's now-overloaded cap. Rocky Patel Vintage '03 Cameroon received a well-deserved 92-rating, earning a spot in the Top 25 Cigars of 2017. The reviews noted, "Its melange of Dominican and Nicaraguan tobaccos serve to showcase and exalt the rare wrapper, which is delightfully sweet-and-sour in character." The burn is perfect and the taste is awesome! The after taste is excellent. Definitely leaves you planning for your next one. Cameroon wrappers have been my favorites for years, so I was excited try this offering from Rocky Patel. Very well constructed. Slightly sweet, and quite spicy. This is not your every day smoke. This cigar is to be savored and enjoyed. From the moment it is lit until it burns your finger it is smooth consistantly and flavorful. A home run! The Vintage 2003 is one of the few full-body cigars with a Cameroon wrapper. The sweetness imparted by Cameroon wrappers is usually relegated to milder cigars. The wrapper adds its sweetness to the complexity of this full-body cigar. Extremely disappointed, I ordered these to share on Fathers Day. #1. The skin outer wrapper is cracking. #2. The draw is hard probably caused by the outer wrapper cracking. #3. The burn was absolutely horrendous again probably due to the nature of the outer wrap. #4. Not smooth have a burning taste. I will not be sharing these with friends, I might drop off at the homeless shelter. Will try to get in a rush order of something else for Fathers Day. I bought a box for son-in-law and thank the Lord I kept some. What a wonderful smoke. Great tasting, good even burn and delicious down to a very short nub. Man I love Rocky Patel Cigars. The Edge has been one of my favorites for many years. I've also tried other RP Blends and this one stands up to all of them. A true Gem! I'm 2 cigars into a Robusto 5-pack. I knew before I lit the 1st one I would not be disappointed & I wasn't. Smooth, flavorful, well balanced & just a delicious smoke right down to the proverbial Nub. The Cameroon wrapper is beautiful & compliments the tasty blend. Easy draw & stays lit. Gobs of creamy smoke draw after draw. A box of the Torpedo's on my next buy list. Nice draw, clean burn and solid flavor. I will definitely add to the rotation. Well balanced, on the stronger end but smooth. Notes of coffee, sweet caramel, light cedar. Cameroon wrapper is nice, oily and dark as expected. Great stick! Cigars we're well package and were not dry or over humidified they were perfect. I just ordered alot more cigar's. I smoke these more frequently than any others. Great flavor, consistent construction and burn. Always flawlessly constructed and even burning, nice clouds of medium smoke. I love both the robusto and the toro. Will try the pyramid if I can find some reasonably priced. If you like Cameroons, this is dead center. Taste good, burn fine, draw difficult. Rocky Patel's Vintage 03 Cameroon is simply the best cigar I have ever had at any price. Yes, it's not cheap, but it can't be beat - great draw, even burn, no bite or nicotine burn or heat all the way to the end. All this and the taste is wonderfully interesting and bold while remaining mellow (after the first three puffs) throughout the smoke. I gave up a much more expensive Cohiba for this cigar. Hard to find - good stuff! The '03 Cameroon was the first Rocky Patel that I tried. And, it was my favorite cigar ever. It also got me hooked on the Rocky Patel brand. I do like other cigars, but RP is my top choice when buying a cigar. I wish it was cheaper for a box, but I understand why they cost so much. Sometimes, i think RP's should cost more. If you love RP or never tried one before, i think you should try or start with the '03 Cameroon. Possible my all time favorite. Got a five pack and tried the first one this past weekend and this bad boy may just end up being my favorite cigar of all time. I've loved the Vintage 1992 for years but the Cameroon is so smooth and flavorful! Was smoking it with friends and I found myself getting lost in the flavor of the cigar and had to be brought back to the conversation several times. Did not want to put it out. Looking forward to another one this weekend! the rocky cameroon 03 is a smooth smoke with creamy sweet favors and a little nutty, and as usual a perfectly constructed cigar with perfect draw and burn. I wouldn't expected anything else from rocky. Rocky Patel is the Eric Clapton of tobacco blenders. Most blends that use a Cameroon wrapper are mild or medium-mild blends. Rocky wrapped a full-body core with a well-aged Cameroon wrapper to produce this medium-full cigar to put a caramel sweet finish on a hazelnut-leather earthy blend that is complex and full of flavor. This is one of my all-time favorite cigars and my favorite that is under $15 a stick. 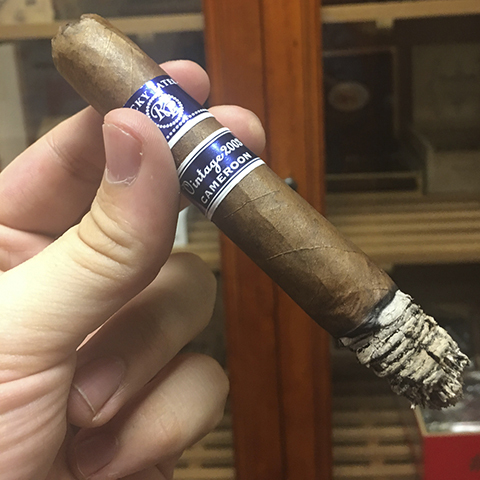 One of the best I have had, I am far from a snob and won't talk about all the minor details, I will put it simple, I have had my share of cigars and I love a good smooth med/full bodied cigar, This fits the build, strong enough, smooth, and delicious. I have smoked 10 or 15 of these Awsome cigars smooth draw razor sharp burn probably the best cameroon out there. Try it and see for yourself you will not be disappointed. The favors in this one are mouthwatering. Superb Cigar all the way around. I think this one is very much underrated and I can say that about the Churchills and Robustos. They have also been consistent and I think one of the best Rockys out there. I would probably rate them to a medium full and start to finish very smooth. Dark Chocolate and Coffee comes to mind on this one and it may be my favorite all time. Excellent Burn and Construction and labeled about as nice as it gets. Insanely good. I wasn't a fan of Rocky Patel so I was less then excited when someone gave me this stick, til I smoked it. Amazing flavor, great draw, great smoke. I would rate this above a Padron thousand series which is saying a lot. This '03 robusto was a fantastic smoke. Very nice construction, minimal viens, rich and deep Cameroon color, awesome coffee and my favorite black pepper tastes. Awesome stick to go with a Texas Steak! This cigar is under rated. Really under rated. The key on this smoke is the Toro. I have never seen such a difference in size between a brans. The Toro size makes the Cameroon wrapper shine. CI price here is outstanding with free shipping by the way. This is a Cameroon delight. First the construction like 90% of Rocky is outstanding. The cigar has three different ranges of smoke---from mild spice, to rich leather to chocolate walnut. You will kill this smoke if it's not treated well--like all Camers it must be at the proper humidity. Never smoke it outside in the cold . One of my top 7 all time. Cheers. Just fired up my first stick. Overall a very good smoke. I found the draw a little tight until about midway. The second third was way better than the first. I had about a month's box time on the stick. With more time I'm sure the overall smoke will improve. Don't be fooled this smoke has no where the complexity of the Vintage 1990 or 1992 but I would still give it a very high grade.